The Alto Vista Chapel is a peaceful little Catholic chapel that was rebuilt in 1952 on the same spot the original chapel was built. 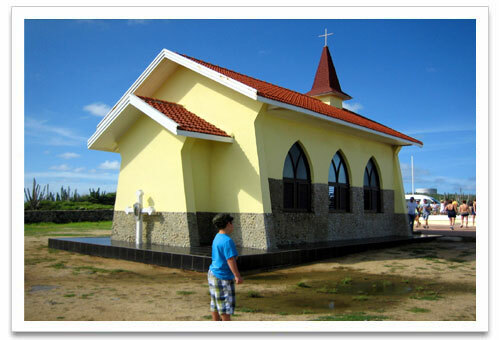 In 1750 a Venezuelan missionary named Domingo Silvestre built this chapel out of stonewalls and a straw roof. He converted the local Indians to the Catholic Christian faith. At the entrance of the Chapel you will notice the stone pews that were built for the over flowing worshipers. 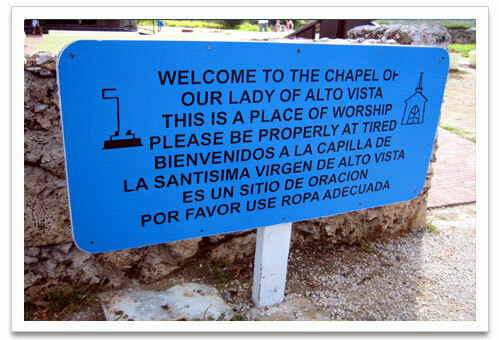 The words alto vista means “high view”. 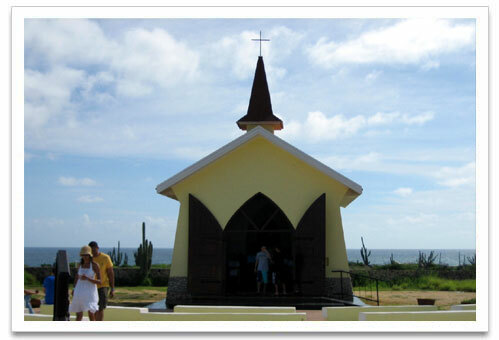 The Alto Vista Chapel is on a hill on the northeast end of the island overlooking the sea surrounded by cactus and shrubs and lovely ocean views. 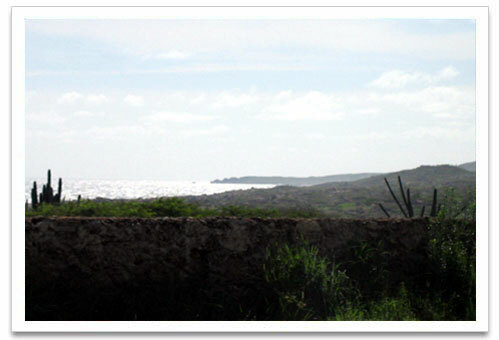 To get there you will travel a winding dirt road while passing several white crosses marking the Stations of the Cross. You will also see two graves at the site that mark the spots where Domingo Silvestre and Miguel Albarez are buried. 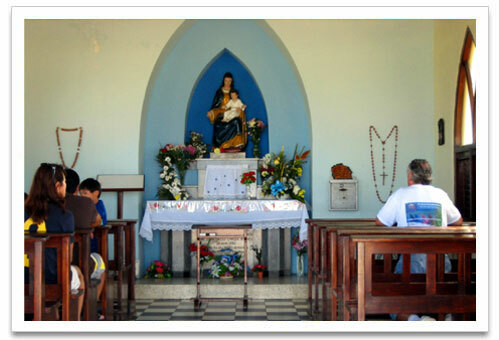 After entering the Chapel you notice how modest the altar appears to be adorned. A wooden cross was brought from Venezuela by a priest and placed on the altar of the original Alto Vista Chapel. That cross is now in St. Anna Church in Noord. A statue of the Mother Mary is now on the altar of the Chapel. 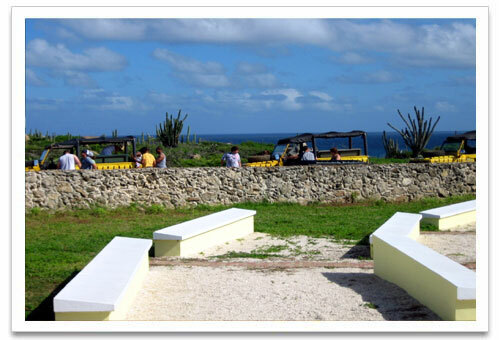 Throughout the day you will notice numerous bus tours, jeep tours, people on dune buggies, rented cars and motorbikes, visiting the historic area. There are no restrooms nearby but you will see refreshments like snacks and soda or water being sold out of the back of a car or truck by a local entrepreneur. 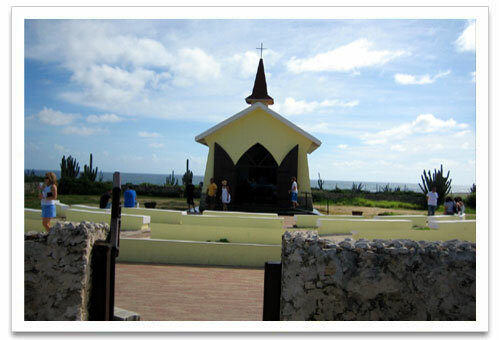 Not too far behind the yellow painted Alta Vista Chapel you will find an area with a Labyrinth Path for you to travel. Some people find the walk around the labyrinth to be very therapeutic. This is a very peaceful atmosphere and many people find it very relaxing. Some say it helps them to clear their mind while others enjoy this area to pray and meditate. If you are not one of those spiritual people you still might find it visually interesting. Local Catholics in Aruba keep alive the annual Good Friday tradition of making the trip from the capital of Aruba, Oranjestad, to Chapel by foot. A priest says mass at this chapel once a week, usually on Tuesday at 5 pm and everyone is welcome. 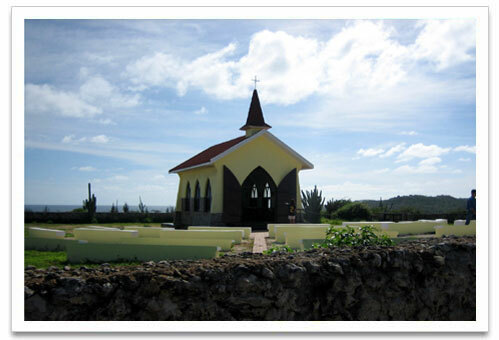 Visiting the Alto Vista Chapel is a nice daytrip and allows you the opportunity to take interesting and unique photos. I’m sure you will only spend about half an hour at this historic site but the drive there is worth the trip. Don’t forget to wear sunblock. Take a hat, snacks and drinks with you. Don’t forget your camera! 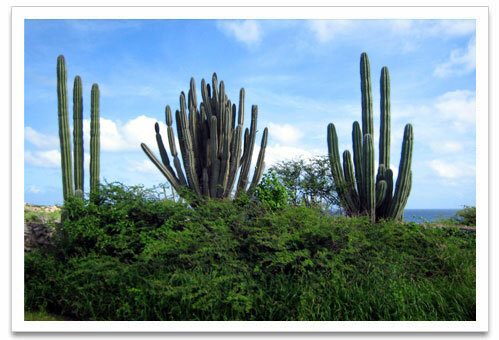 After visiting the Alto Vista Chapel drive further down the road and check out other sights to see in Aruba like Arikok National Park. If you're looking for a place to cool off after visiting the Alto Visita Chapel, check out our Baby Beach page.